In light of my upcoming ordination on September 19-20, many of you have asked the question: “What is ordination?” This blog post is my attempt to answer this important question. Ordination, according to one source, “is an act of the local church confirming their confidence in the call of God to a man for specialized service. Through special examination of personal testimony and knowledge of the doctrines of scripture that confidence is validated.” Another source states, “Ordination is the public recognition of a man called to and qualified for ministry…It confers no ecclesiastical or spiritual power, but does recognize the work of God in his life. It is a solemn and blessed time in the life of a man and his church and should be approached with diligent prayer and preparation.” Both of the these definitions provide a succinct and holistic explanation of ordination. Ordination is an act of the local church – It is important to realize that you, as Prairie Flower Baptist Church, will be ordaining me (Lord willing), not the council of men we are inviting. The ordination council (which meets at 9 AM on Saturday, September 19) is simply going to examine my life and theology (for approximately 3 hours in a verbal examine) and give a recommendation to you (the local church) on whether or not they believe I am called of God to the Gospel-ministry. These men on the council are highly educated, respected, and experienced men in the fields of pastoral ministry and theology. Their recommendation should be carefully considered, but it is not binding or mandatory. As a side note, it is strongly recommended that you (i.e. the individual church member) attend the ordination council meeting for two primary reasons: 1) You (not the council) will be voting on my ordination, and 2) You will find yourself greatly encouraged and blessed as you hear many good questions (and hopefully good answers) on the full spectrum of Bible and theology. My goodness…some of the questions will be so deep and involved that I won’t even know how to answer them (fun, but let’s hope these type of questions are few and far between). Ordination is all about instilling confidence – Please know that ordination has more of a benefit to you (as a church) than to me (as a candidate). It is important to note that ordination is not mandated in Scripture (nor is it prohibited) and in no way bestows upon me any special grace, abilities, or power. Yes, I will be personally blessed by the act of ordination and in some states (not Iowa) I will receive legal benefits, but that is not my reasoning for pursuing ordination. My main reason for seeking ordination is pastoral in nature, namely, I want you to have increased confidence in my God-given ability to shepherd and lead you as the Lead Pastor of Prairie Flower Baptist Church. Ordination confirms the call of God on my life, it does not qualify me to serve – It is vital to understand that the act of ordination does not make me qualified or equipped to serve in pastoral ministry, it simply confirms my qualification and equipment for pastoral ministry. Essentially the council and you (i.e. the local church) recognize in a formal examination and service the call of God on my life. Ordination is a solemn and blessed time for both the candidate and his church – Ordination is a solemn time, not a boring time. Ordination is a blessed time, not party time. Thus, both the candidate and his people should approach this event in passionate prayer and with serious joy. Also, it’s important to note that ordination is not without biblical precedent. We see forms of ordination littered all throughout the biblical narrative, specifically, in the book of Acts (cf. Acts 6:6, Acts 8:17, Acts 13:3). Again, ordination, in its present form, isn’t mandated in Scripture, but it’s not without biblical merit. So there you have it. 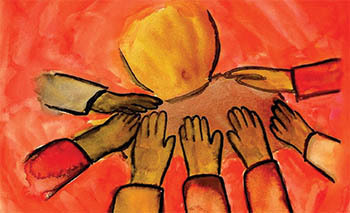 Ordination is an act of the church in order to instill confidence in the church by means of confirming an individual’s call to serve in ministry. Such an act is a blessing to all involved. Thus, I trust that I will see you at both the ordination council and ordination service on September 19 and 20! ← What is the church really about?